Good Thursday everyone! Hope everyone is enjoying this beautiful September so far. I live in Calgary Alberta, Canada where there really isn’t a Fall season. It goes from summer to winter in a heart beat so the longer that it feels like summer the better! I was reading Danger Girl yesterday outside in the sun and I’m quite content to do that for another couple of months. Today’s page is all action as we have two epic battles going on with Casanova taking on V-Scope and Deadeye trying to bring down Eagleheart. This was a challenging page to do as I wanted to have the fights taking place at the same time on one page (something most people don’t even attempt) and I wanted the page to read either traditionally or vertically. You can read the page by going left to right and see how Deadeye is doing compared to Casanova or you can read it vertically and follow V-Scope’s defeat and then see why Eagleheart has been around for 200 years. 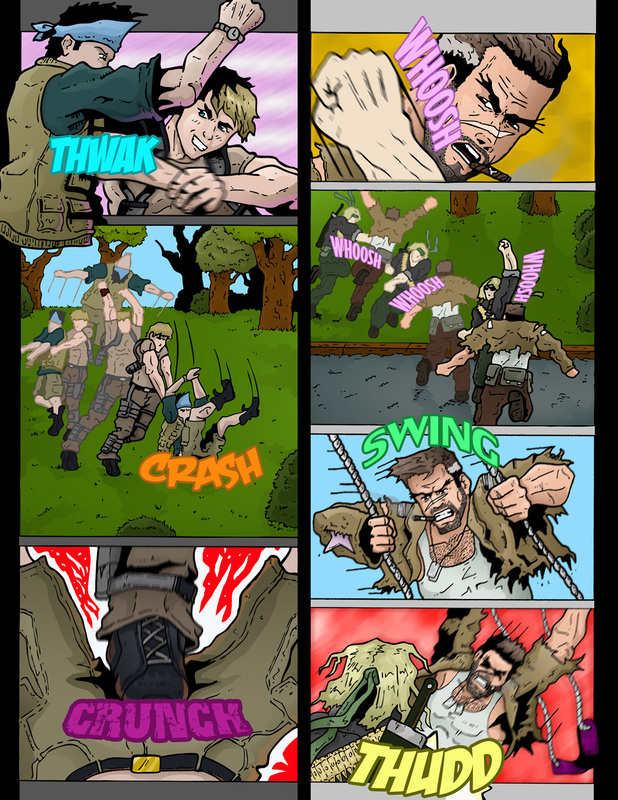 I also wanted an all sound effects page because when Team Stryker gets serious they don’t have time for chatter when there is pain to distribute. In other Team Stryker news I’ve completed Mission 003 and it will be available to read in October! It is the greatest challenge I’ve faced so far in my artistic career and I couldn’t be prouder with the results. I’m really hoping that its Mission 003 that launches TS into the stratosphere and takes the world by storm! I can’t wait to share it with everyone. Have a great Thursday and I’ll be back on Monday to bring you another hard hitting page of Team Stryker!